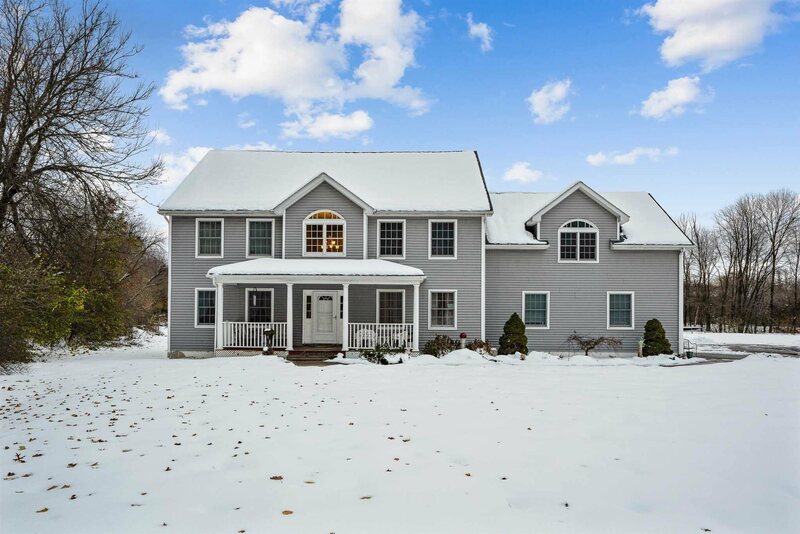 Lovely Contemporary Center Hall Colonial is sequestered on 1.06 acres of landscaped and tree-lined property, located in a delightful neighborhood of Wappinger Falls. Set apart yet close to all one could need for shopping, services, schools, parks and just minutes to NYC trains in nearby New Hamburg. This perfect 4 Bedroom, 3.1 Bath modern home has been recently updated in 2018, offering the best of 21st century amenities. Guests are welcomed through the rocking chair front porch into the foyer, where the formal dining room with hardwood floors and living room invite all. The living room flows back into the fabulous family room with warming fireplace, hardwood floors found throughout and sliding French doors to the patio overlooking the brand new 27&apos; above-ground pool in fenced area and deep grounds. The family room is wide open to the gourmet kitchen, appointed with custom cabinetry, granite counters, breakfast bar and high-end stainless appliances. Off the kitchen is a discrete powder room, laundry room and a few steps down to an office or perfect guest bedroom with full bath and relaxing den with double doors to the large driveway. The second floor offers the master bedroom suite with walk-in closet and master bath with soaking tub and spa shower, three additional bedrooms, full hall bath and large bonus room. With a 2-car detached garage and too many upgrades to list, this charming home is pristine and move-in ready to entertain and enjoy a sophisticated lifestyle.